Belgrade will get another modern shopping center in Spring 2020 situated at the corner of Vojislav Ilica and Mis Irbijeva Street. MPC Properties and Atterbury Europe started the joint project yesterday with the official laying of the foundation stone where the new building will be built. The building will cover the area of 130,000 m2 and have more than 43,000 m2 of commercial space. The investment is valued at EUR 110 million. The new shopping center will thus provide rich offer in a place which was in need of a modern shopping destination. In the immediate vicinity, only 15 mins away on foot, there is a neighbourhood with more than 350,000 residents. Aside from its location, the shopping center will stand apart thanks to its innovative concept that follows the latest trends in retail, with more open spaces, plenty of natural light and greenery in order to provide topmost shopping and recreation experience. The modern design of the building is the work of international architecture firm Chapman Taylor based in Düsseldorf. – By analyzing the market and following global trends, we have estimated that now is the ideal moment to give the place that doesn`t have a modern shopping destination a quality, rich in content and modern shopping concept. The shopping center will be distinguished by a specially curated mix of more than 150 international and regional brands, from fashion to sport, cinemas and supermarkets and rich gastronomic choice of coffee shops and restaurants. - said Ingo Nissen, the director of MPC Properties. He pointed out that more than 60% of the commercial space has already been leased out which spoke volumes about how attractive this location was. He also thanked the city management for exceptional cooperation and for promptly issuing all necessary permits. – As one of the investors, we at Atterbury Europe are extremely proud that the construction of this modern shopping center together with MPC Properties has begun. Belgrade is a very dynamic city with great potential for progress and it is our privilege to be a part of this exceptional project that will transform the abandoned industrial location to a place for people to relax and enjoy themselves, said Raoul de Villiers, Head of Developments at Atterbury Europe. The ceremony was attended by Deputy Mayor of Belgrade Goran Vesic, who said that this project was another important confirmation that Belgrade was an attractive destination and added that the local government would continue supporting investors. 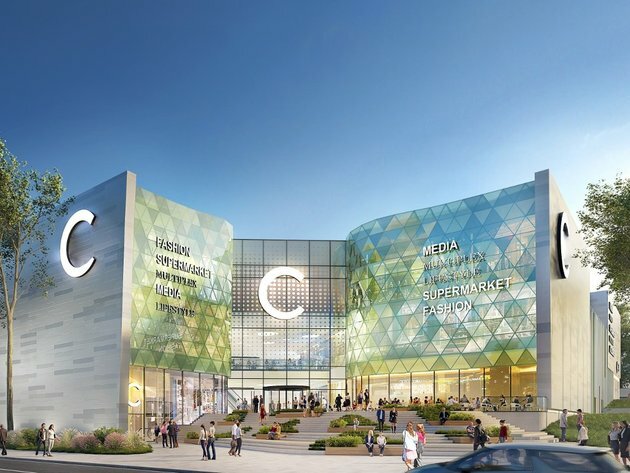 New shopping center is another of many investment projects of MPC Properties company that has a noted market presence in the region since it owns the biggest shopping center in the region - USCE Shopping Center, Mercator Center Belgrade, Usce Tower I and II and Navigator Business Center I and II. New shopping center at the corner of Vojislav Ilic Street and Mis Irbijeva Street will be managed by Confluence Property Management.